Spring has sprung. I know because as I was walking past Little Lake, where I take my daily constitutional, I saw the little hockey rink was not where I left it. It had moved downwind about three hundred meters, powered by the folding canvas chair stuck in the ice that acted as a sail. To see that chair begin its journey towards the river, why, it almost made me wish I was sitting in it. But oh, the bugs. Since the first day of spring they have more than doubled their activities, and I can catch in three days what I used to catch in a week. While that’s bad news for me, it’s good news for the Painting with Bug Blood series. 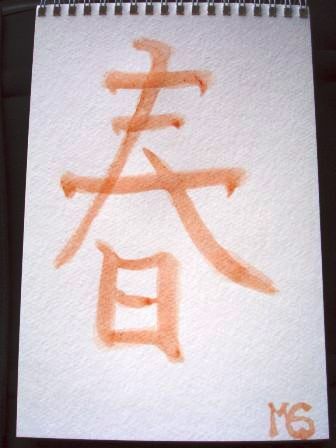 While the bug blood I kept in the fridge had thickened and turned a rusty colour, I still doubted whether it would be enough to get a rich hue on first stroke. Believing I had watered down the paint too much last time, I vowed to be more careful with the second batch. I followed the same procedure this week, but it proved difficult to extract any blood without using at least a modicum of water. I wondered if next time I would have to resort to the more labour intensive method of pricking the bugs individually with pins. For the time being, I produced another dish of thin soupy paint. 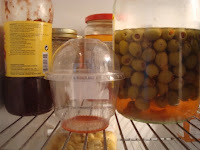 After a moment’s hesitation, I mixed the fresh with the old and swilled them together. Encouraged by the positive reception to my Canadian flag painting, I returned to my copy of "Chinese Brush" by Lucy Wang for inspiration. The temptation was to leap straight into painting plants and animals, but Ms. Wang insists on practicing basic strokes. Recognizing this step as necessary if I were ever to produce real paintings, I dutifully began the exercises on page four. 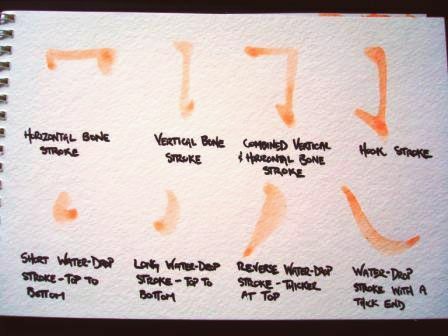 Apparently there are two methods of holding the brush, the first being at a ninety degree angle from the page and somewhat counterintuitive. 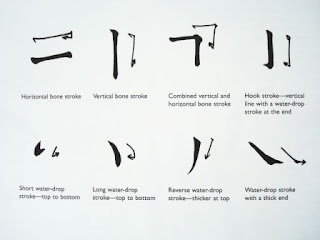 This method produces the “bone stroke,” which takes its name from the knobby ends on either side. 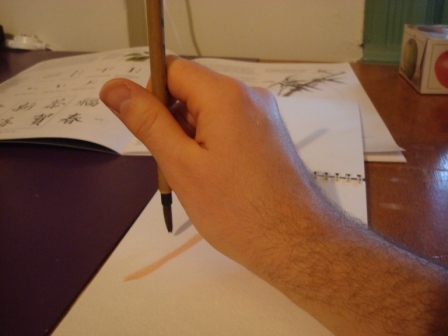 The second method is the water-drop stroke, which allows you to hold the brush at an angle to the page. Above you can see Ms. Wang’s examples. 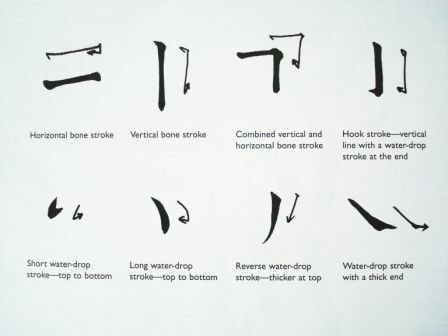 I tried all eight strokes myself, and I believe you can see an improvement even in reading from left to right. I still have to work on my bone strokes, but I felt ready to tackle the next challenge.